Just in time for the next Soul Deep vs Smooth N Groove Event, Scott Allen is proud to present the next installment of the Sounds of Soul Deep Mix Series. However, this is no ordinary mix... The mix features the precise vocal stylings of the Stamina Resident Emcee, the one and only, Emcee Tell. The flows on the mix are so pristine, it almost sounds like the songs were produced around the vocals. Tracks included in the mix are produced by Madcap, Furney, Cosmic Sequence & Leniz, Carter, and Locksmith. 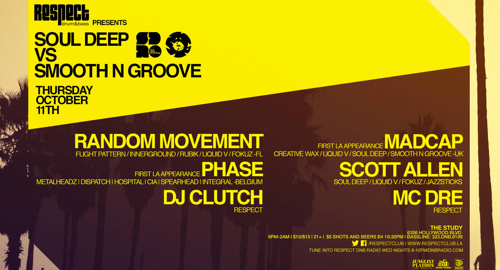 If you like what you hear, please join us for the next Soul Deep vs Smooth N Groove Event on October 11th, in Los Angeles. The Event will feature the talented, Random Movement, Madcap (first U.S. apperance), Phase (first U.S. appearance), Scott Allen, DJ Clutch, and amazing vocals by MC Dre and Emcee Tell. If you like the mix please like and share!! Enjoy the vibes!